Original art done by Artisticdude. 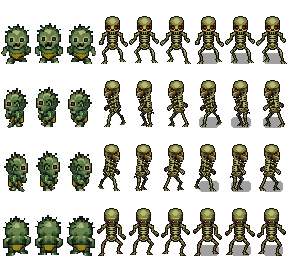 Images scaled to usable with 32x32 tiles and added walking animation. When scaling pixel art, you can't just resize it. It has to be done by hand. I'm afraid these are unusable. So no scale image tool for pixel art? Even if smoothing is done by hand? 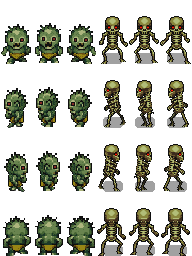 I added new version of skeleton. Now scaling is done by hand and plus added another version with simple shadow. In Paint.net you can choose "Next neighbor" as the interpolation method within the rescaling menu. This way you avoid the blurry effect. Makes it a bit easier, but you still have to do some work by hand. Yes you can. Each art here has listing of licenses which are selected by who made the art. You can choose one of those license and use it. Here is CC0 which means you can do what ever you like with this art. You can click of each license and see how you use them. CC-BY requires that you give attribution to whom made the art and so on. CC0 does not require any attribution. 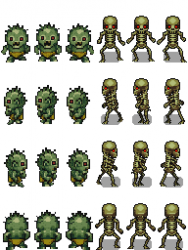 So you do not need give any credits for me doing these zombies and skeleton. If you like you could say something like "Public domain graphics from Opengameart.org"
You probably read CC-BY license although I do not think that requires link either. Thank you very much ! that's great!